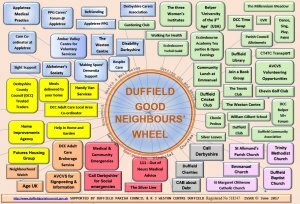 A Duffield group working to improve the lives of the over-50s in the village has produced a very helpful source of information aimed specifically at this age group called the Good Neighbours' Wheel. The leaflet draws together contact details for all the various service providers including the Weston Centre, Amber Valley CVS and church-run groups, and includes contacts for groups that can help with health and wellbeing, getting out and about, emergency contacts, financial assistance, leisure activities and household advice. Paper copies can be found at the Weston Centre, in Duffield Library or from Duffield news; the full version of the Wheel can also be downloaded below as a PDF file. If you have a neighbour or family member who might benefit from this information, why not pass them a copy?